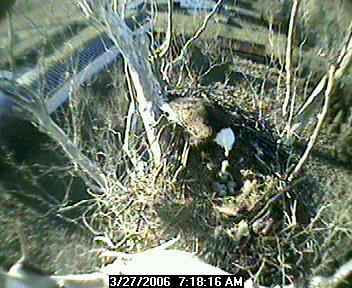 Ralph Bame called last evening and shared another wonderful live cam site for all of you ornithologists. This is National Geographic’s Crane Cam. 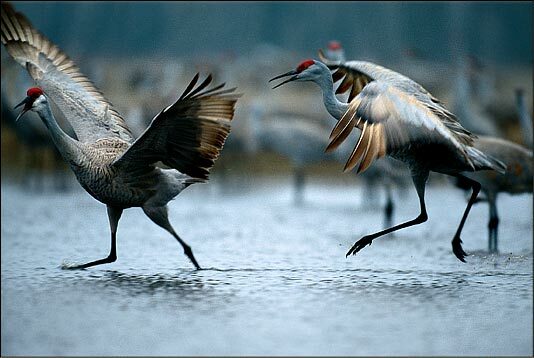 Swirling gray masses of sandhill cranes descend on south-central Nebraska each year, heralding the arrival of spring and the largest gathering of cranes in the world. The Platte River Valley becomes a six-week pit stop from late February to early April for a half million sandhill cranes journeying north to their Arctic breeding grounds. 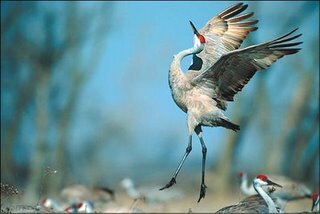 As one of the world’s oldest bird species, these elegant, red-headed birds—also known as Grus canadensis—have been a part of Nebraska’s landscape for more than nine million years. And for them, the Platte is the perfect place to take a break during their migration. Lean after traveling from their winter homes in New Mexico, Texas, and northern Mexico, these omnivorous cranes spend their days feasting in farm fields and wet meadows surrounding the Platte. Eating insects and waste corn enables them to pack up to two pounds (one kilogram) on their stately frames, which weigh 6 to12 pounds (3 to 5.5 kilograms) and roughly stand four-feet (one-meter) tall with a six-foot (two-meter) wingspan. 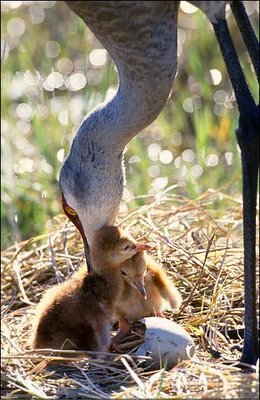 This vital energy reserve helps ensure the cranes’ survival and reproductive success after they leave the Platte for Canada, Alaska, and Siberia. The valley is also a critical migration stop for 20 million other northbound migratory birds, including highly endangered species such as the whooping crane, piping plover, and interior least tern. For several years conservation groups, farmers, and political leaders in Nebraska have been working on setting aside water for these birds and increasing their already preserved habitat from 14,000 acres (5,650 hectares) to 29,000 acres (11,750 hectares). In the near future they hope U.S. Secretary of the Interior, Gale Norton, and the governors of Nebraska, Wyoming, and Colorado—whose states use the Platte’s water—will sign an agreement to ratify the increase.Enjoy watching these magnificent birds. This week the best viewing times are in the morning from 5:50 – 8:30 a.m. Central Time and from 6 p.m. to 8 p.m. Central Time. During this week 500,000 cranes are expected along this 80 mile stretch of the Pla tte. Our NCTC eagle eggs have hatched. On March 18th one of the eggs hatched.On March 21st another hatched, and finally, on March 23rd the third and final egg hatched! The parents are now busy feeding the young. The young will stay in the nest about 11 to 12 weeks when the adults will start encouraging them to fly. The eaglets can often be seen exercising their wings on the nest or on a nearby branch several days prior to fledging (first flight from the nest). The young will stay at or near the nest for the next 6 weeks while the adults continue to feed them and teach them to hunt and fish on their own. Young eagles are believed to return to within 100 miles or so of their own nest site when they reach maturity and are ready to mate. OK! THE STENCH IS HERE! Oh my, the Amorphophallus has bloomed and once again the house is permeated with the smell of rotting meat! 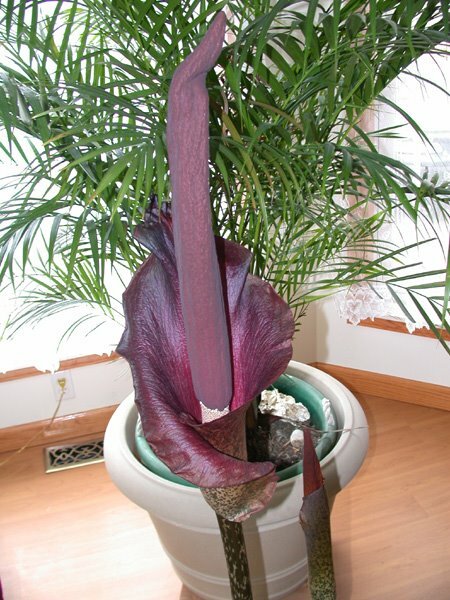 If it were not such a bizarre bloom and so huge, I think it would not be worth the negative olfactory stimuli that it triggers in the brain. The wife has not emerged yet from her sleep. My guess is that as soon as she smells the critter, it will be exiled to the far end of the basement. Have a happy and odorous day! 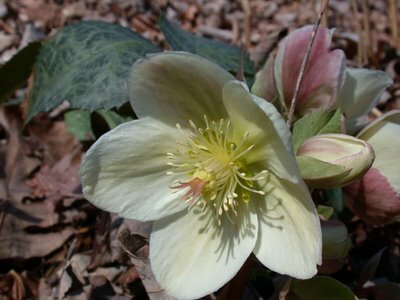 Well, our hellebores (Lenten Rose) are blooming today. These plants are in a group that we call the “harborings of spring”, since they can often be seen blooming in the snow. The Lenten Rose prefers shade and, according to the “experts” naturalize rather nicely in a woodland setting. I am still waiting for this naturalization! My three plants have looked at me for three years with little growth spurt. The leaves are dark green, leathery, and do not die back in the winter. I consider the flowers to be very happy! 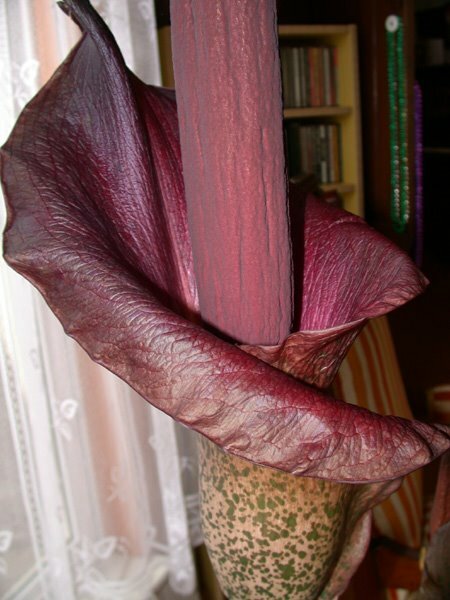 Flowers are usually nodding, either bell or cup-shaped. As you can see, they have a very noticeable central boss of stamens, ringed by rounded petaloid sepals. These sepals often persist for several weeks after the stamens are shed. Yes, in my January 28th posting, I introduced you to the dormant Amorphophallus plants lying peacefully in a handmade oak basket. 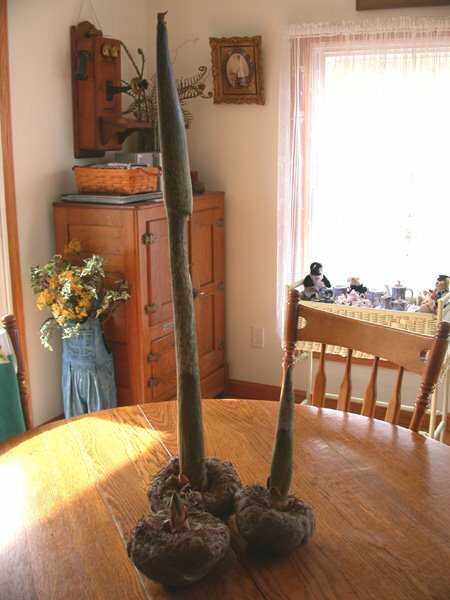 They have now been having their typical spring growth spurt. As you can see, the critters are on their way to blooming. I shall post the blooms when they appear. Wish somehow I could post the odor!! 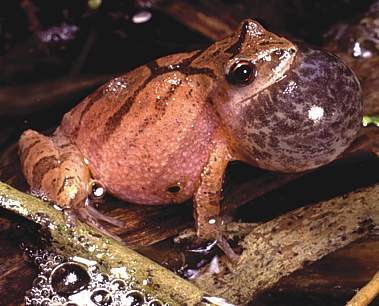 It’s that time in Appalachia when we are greeted with the breeding calls of our frogs and toads. Yesterday it was near 80 degrees! As the rains arrived, the calls of the Spring Peepers (Pseudacris crucifer) were celebrating one of the warmest days of 2006. 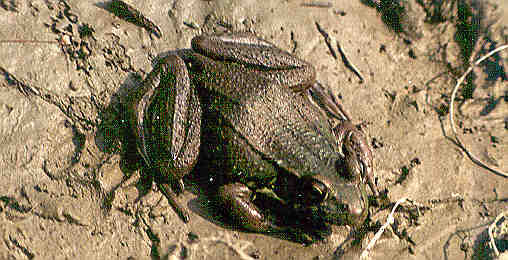 The above photo is of a spring peeper photographed as it was calling for its mate. 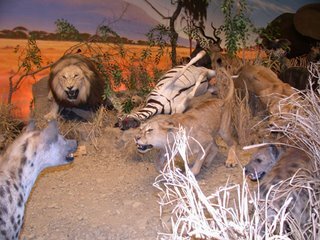 The males of the species are the ones who are responsible for “yelling” to attract a female. 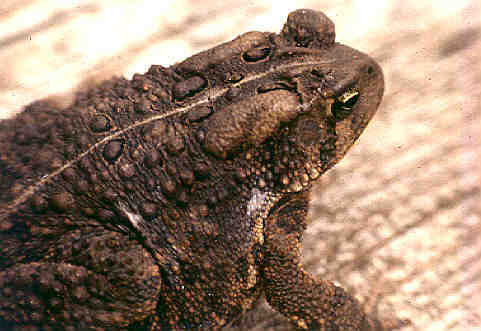 I will need to discuss the process of amplexus (the mating behavior in frogs and toads) in a later posting. One of the joys of teaching Vertebrate Zoology was the sense of accomplishment obvious on the faces of the students when they succeeded in learning and vocalizing all the calls of the WV amphibian species. Field trips reinforced our vocal and observational skills. It is so easy to distinguish between one frog/toad species quite unlike our ornithology friends where the specific calls of our feathered beasts can be extremely difficult. Last night as I was driving back to Glenville, the wood frogs (Rana sylvatica) were hopping across the wet road surface. 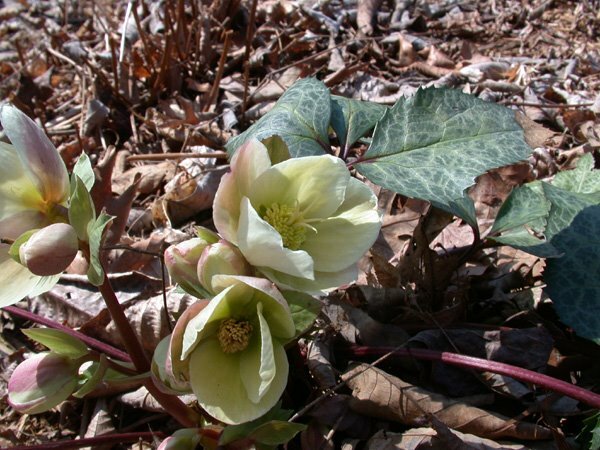 It is the wood frogs and the spring peepers that are a few of the earliest critters to welcome in the spring season. The photos below illustrate a couple of the amphibians that will be calling later in the spring. The American toad (Bufo americanus) is distinguished by it’s long trill-like call and the Green Frog (Rana clamitans) is characterized by its banjo-like call. My last several postings dealt with our great trip to Savannah, Georgia occurring the last of February. 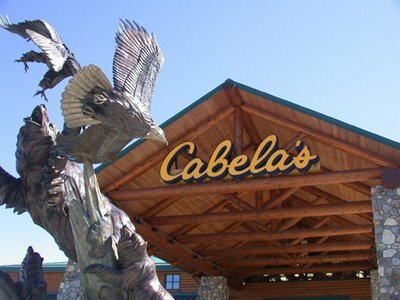 Today we move back to West Virginia and introduce you to one of the unique shopping opportunities for the sportsman. 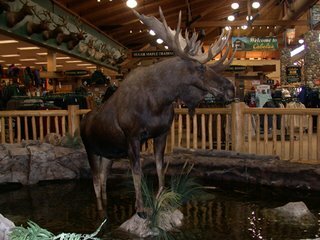 While visiting Wheeling last week, we stopped by Cabela's West Virginia Retail Store. This store, opened in August of 2004, is located just off I-70. 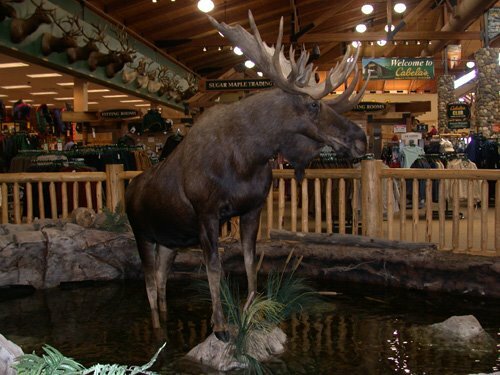 In addition to offering quality outdoor merchandise, the 175,000 sq. 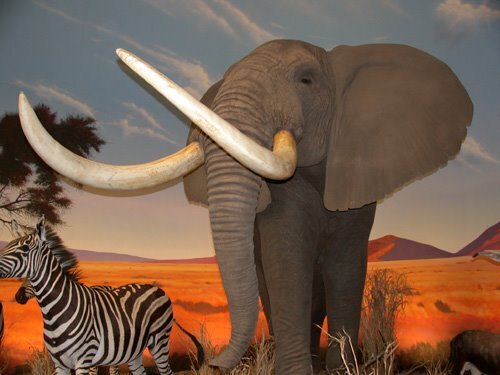 ft. showroom is an educational and entertainment attraction, featuring a décor of museum-quality animal displays, aquariums and trophy animals interacting in realistic re-creations of their natural habitats. The centerpiece of a Cabela's store is Conservation Mountain, featuring hundreds of museum-quality wildlife displays. Huge aquariums grace the fishing department, where fish native to each store's geographic location are on display. 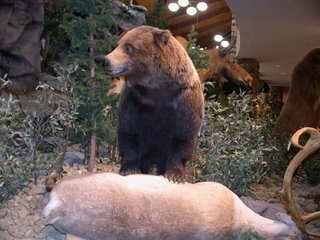 I must say that at first I was sad to see the native and exotic animals that have been killed and displayed in this store. 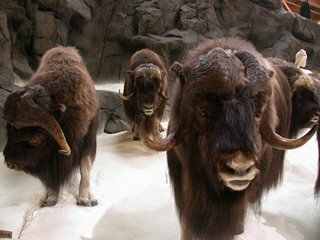 The more I thought about it, I came to the realization that many folks would never have the opportunity to see examples of these animals. The habitat displays are excellent! I have rarely seen museum specimens that equaled the quality of the animals displayed here. I have posted several examples of the animal displays for your perusal! 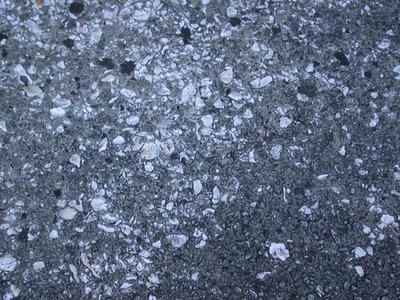 Tabby is a concrete made from lime, sand and oyster shells. 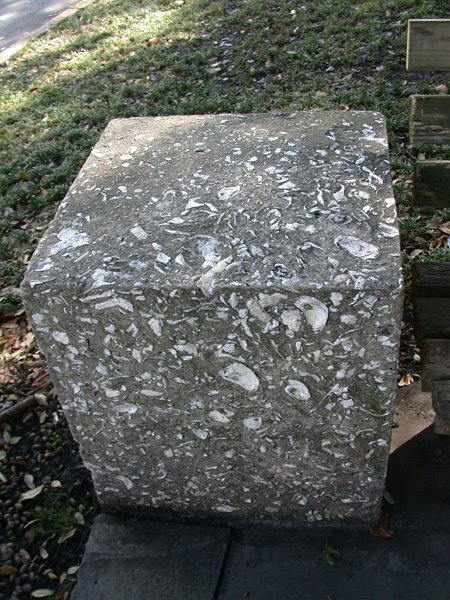 Its origin is uncertain: although early documents record Indian burial vaults with walls made of oyster shells and lime, no such structures have survived. It is likely that Sixteenth-century Spanish explorers first brought tabby (which appears as "tabee", "tapis", "tappy" and "tapia" in early documents) to the coasts of what would become South Carolina and Georgia. Tapia is Spanish for "mud wall", and, in fact, the mortar used to caulk the earliest cabins in this area was a mixture of mud and Spanish moss. There is evidence that North African Moors brought tabby to Spain when they invaded that kingdom: a form of tabby is used in Morocco today and some tabby structures survive in Spain, though in both instances it is granite, not oyster shells, that is used. Early settlers found only trees and the raw materials for tabby (and none of the stones and brick-clay they had known in Europe) when they began building permanent structures in this coastal area . The Native Americans of the Sea Islands had left many heaps of shells, the accumulation of countless past oyster roasts. Builders extracted the lime by burning the oyster shells. 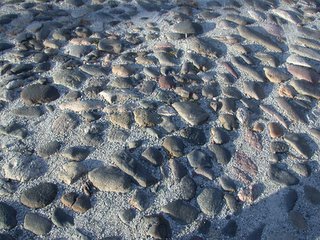 They then painstakingly removed all salt from the shells and from the sand to keep the concrete firm and whole (the salt weakened the concrete mixture). The cleaned sand, a mixture of coarse and fine varieties extracted from sand pits, was added to the lime and shells to make the tabby concrete. Oyster shells," wrote Earl D. Dietz, "are primarily calcium carbonate. When they are 'burned' they are heated to a high enough temperature to decompose the calcium carbonate to lime (calcium oxide) and carbon dioxide, which dissipates in the air. The resulting lime mixed with the sand, the oyster shells and water reacts with the water, and to some extent the sand, to form a bond for the mixture. Thus Tabby is a concrete. Today, artificial tabby is made using Portland cement instead of lime and the resulting 'tabby' is stronger and more stable. In this area there are many driveways and walks made from the artificial tabby." This tabby was used to construct the sidewalks on River Street. My wife loves to tour historic houses. 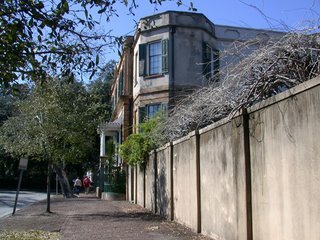 We were able to tour the Owens-Thomas house during our Savannah visit. The House was designed by architect William Jay at the young age of 24. The stylish residence was built from 1816 to 1819 for cotton merchant Richard Richardson and his wife Francis Bolton, the sister-in-law of William Jay. Unfortunately the Richardsons soon lost heir house in the financial depression of 1820. 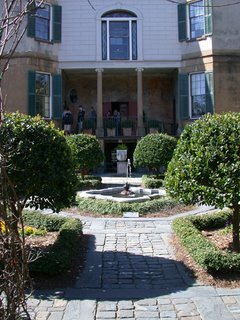 During the next decade the House served as an elegant boarding house, and in 1825 the Revolutionary War hero, the Marquis de Layfayette, was a guest. 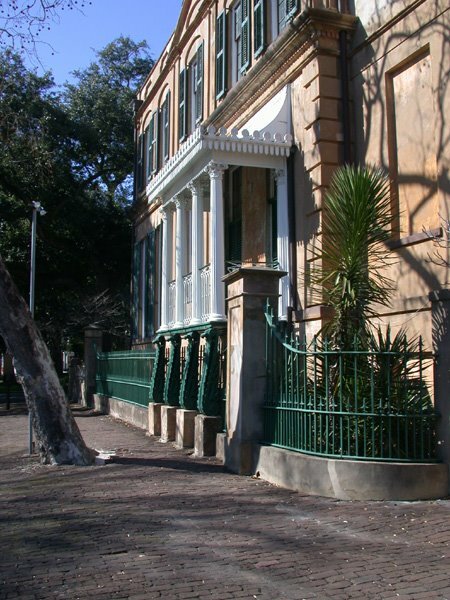 According to Savannah's oral tradition, the celebrated Frenchman delivered his two Savannah addresses to thousands of adoring citizens from the ornate cast iron balcony on the south side of the house. In 1830, George Welchman Owens, congressman, lawyer and one-time mayor of Savannah, purchased the House from the Bank of the United States for $10,000. The property remained in the Owens family until 1951 when Owens' granddaughter Margaret Thomas bequeathed it to the Telfair Academy of Arts and Sciences, now the Telfair Museum of Art. 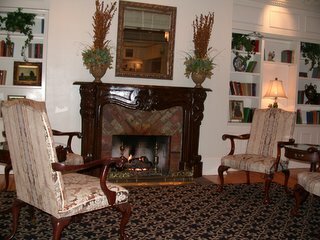 The interior is Jay's unique interpretation of the Regency style. Unusual features include a brass inlaid staircase, with a unique bridge spanning the central stairwell, a Greek-key patterned window of amber glass in the dining room, and the magical effect of the drawing room ceiling. Jay combined imported materials and the latest London technology with indigenous construction techniques. The House is largely made of tabby, a concrete-like mixture of lime, oyster shells and sand. The exterior is English stucco and the front garden balustrade is coadestone, an artificial stone made in London. An elaborate plumbing system was installed in 1819 with rain-fed cisterns, flushing water closets, sinks, bathtubs and a shower. Eugene, our palmetto rose man! As we walked east along River Street and before we got to the Boar’s Head Tavern and Grill, we discovered this fellow selling his creations on the street. 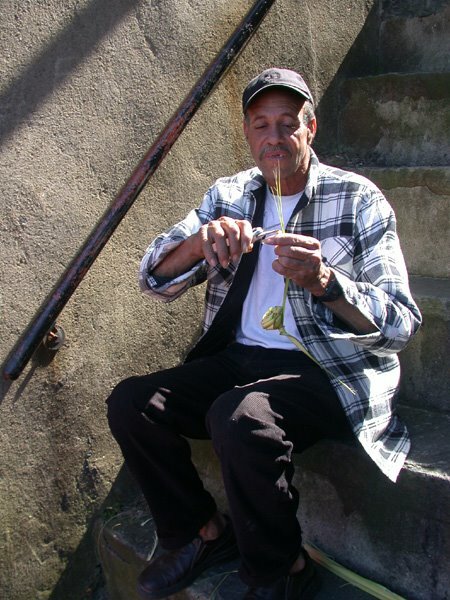 Eugene has made palmetto roses since he was fourteen years old. It is said that during the War Between the States Confederate Soldiers went off to war wearing Palmetto Roses woven by their sweethearts. This unique craft comes from the coast of South Carolina, Georgia, and Florida. 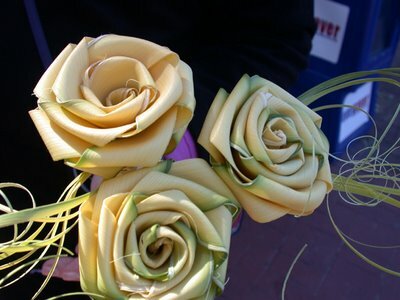 Hand-woven out of fresh palm leaves, the roses stay green for 3-4 days. After that they dry naturally, change color and last forever. Palmetto is a kind of palm tree that grows wild in the coastal south-eastern United States. The leaves of the Palmetto are used by the craft artist to produce this unique product. The young palm leaves are soft and green. 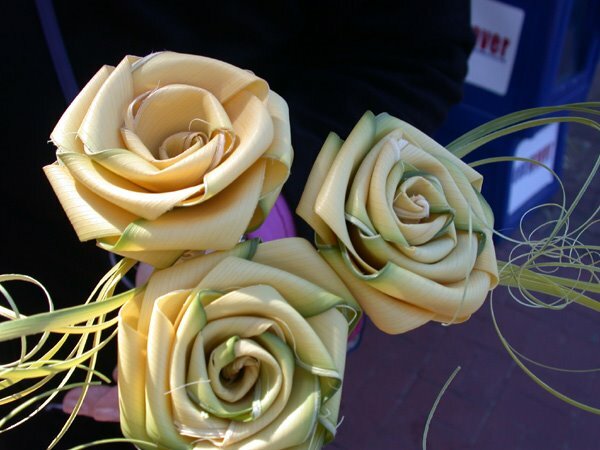 This allows the craftsman to weave them into a rose shape. After a few days they dry and turn to their natural dry color. Palm roses keep their shape forever. On the bluff facing the Savannah River are nine blocks of renovated cotton warehouses that house about 80 restaurants, pubs, night spots, hotels, shops, galleries, and boutiques. 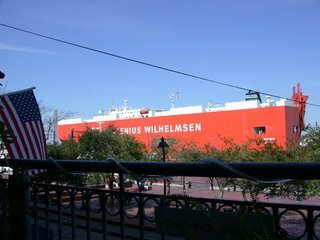 Adding to the sight-seeing is a working harbor of huge, building-size cargo ships, tug boats, and sailing ships that are seen plowing the waters of the Savannah River (see photo below) . During the day, families stroll alongside the river, eating ice cream cones and browsing in gift shops. 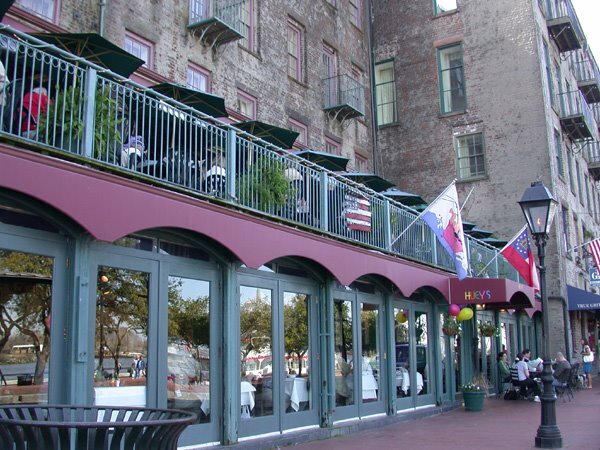 At suppertime, people are seen feasting on seafood and steaks in some of Savannah's best restaurants. 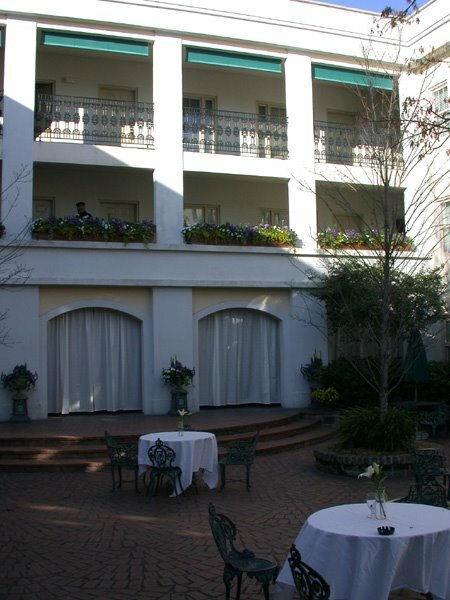 Come sundown, Savannah's night life kicks in, and couples amble through the streets as live music reverberates out of pubs and nightclubs. It hasn't always been this way. The city had turned its back on the historic waterfront, which was abandoned and deteriorating when a wide-ranging group of civic leaders joined forces in the early 1970s to create the River Street Urban Renewal Project. 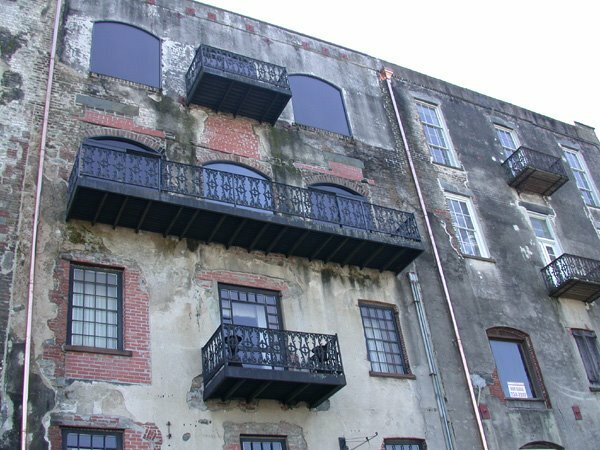 When the work was finished in 1977, approximately 80,000 square feet of abandoned warehouse space on the historic waterfront had been transformed into Savannah's most popular tourist attraction. Additional improvements have produced an attractive city park that hosts many festivals and special events. Here are a few photos taken along River Street. 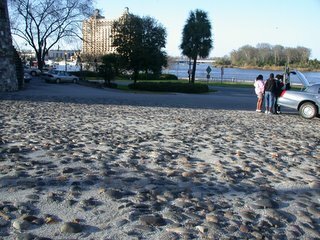 As we approached the waterfront on River Street in Savannah, we noticed two memorials. 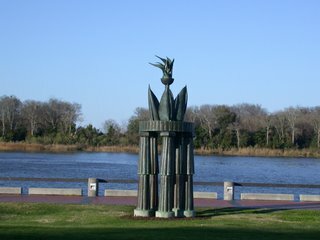 The first was a memorial to the 1996 Olympics, during which Savannah hosted the yachting events. 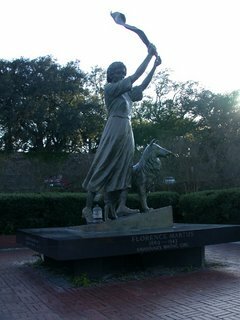 The second memorial is a statue of the Waving Girl, a 1971 statue by Felix De Weldon that honors Florence Martus, a Savannahian who greeted every ship entering the port from 1887 to 1931 by waving a cloth from her home on Elba Island. Let me provide a little interesting history concerning Florence Martus. 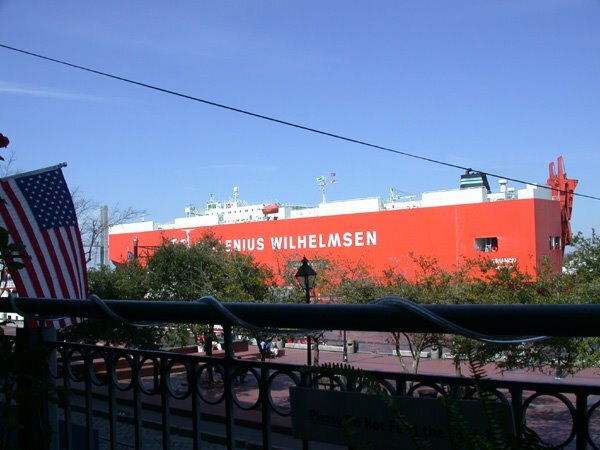 For 44 years, Florence Martus met every ship entering the Savannah River and every outgoing ship headed for the uncertainties of the Atlantic Ocean. She became a seafaring legend. Martus was born on Cockspur Island Aug. 8, 1868, in a frame building just north of Fort Pulaski. 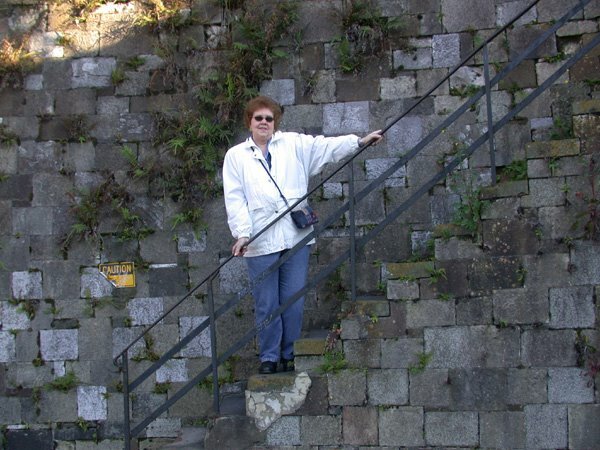 Her father, John Martus, a Civil War veteran, had recently completed 40 years in the U.S. Army and was assigned as ordnance sergeant at the fort. Until she was 13, Florence and her brother George led uneventful lives. But in 1881, a hurricane heading for Savannah blasted tiny Cockspur Island. Her family, fleeing the wrath of the storm, sought refuge in the nearby fort. But it too was threatened when water began to pour into the parade grounds. The Martus family finally found safety in one of the spiral stairwells deep within the fort. During another colorful summer, Martus and her brother rescued the 31-man crew from a government dredge that had caught fire. All, except one of the crew members, survived. When George accepted a job with the Lighthouse Service in 1887, Florence moved with him to the lighthouse keeper's house on Elba Island. It was at the cottage (a white, two-story house with a columned porch) that Martus, 19, began greeting ships. Waving a white handkerchief by day and a lantern by night, she welcomed both incoming ships and outgoing vessels. She claimed to have waved at every vessel during her 44 years on Elba Island. Years later, when asked in an interview with Ernie Pyle if she ever missed a ship in all that time, she replied: "I was never too sick to get up when one was coming and I could always hear them coming." In time, Martus earned the nickname "The Waving Girl" and became known throughout the seafaring world, receiving letters from hundreds of sailors. Romantic stories emerged. 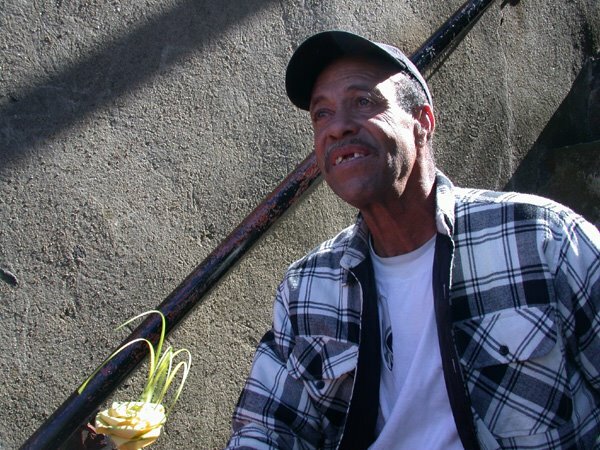 The most popular story was that of a sailor sweetheart who was lost at sea. She waved at other seamen, the story goes, as a tribute to her lost love. She never verified the story, but she never denied it either. A passenger, on board a New York-to-Savannah steamer during the first quarter of the 20th century, recalled Martus' greeting: "The first I saw of her was at sunrise. The little white cottage where she lived was close to the bank. She was a little thing, thin, but sturdy looking. The wind (was) whipping at her skirt and almost tore the cloth out of her hand. The sun showed her hair as gray and curly with red color still in it. Her eyes were blue. She wasn't pretty, but so alive. Her smile was one of the warmest I've ever seen. We saluted her with three blasts. I followed the ship's rail all the way to the stern, looking at her as long as she was visible. "After George retired from the Lighthouse Service in 1931, Florence, who never married, moved with him to an apartment at 642 E. Liberty St. From Liberty Street she moved to Thunderbolt. To celebrate her 70th birthday, 3,000 people descended upon the parade grounds at Fort Pulaski. Two bands, the U.S. Marine Corps Band, and the Savannah Police Department Band, played while the Coast Guard cutter Tallapoose fired a salute. On a cold and windy November day in 1943, a liberty ship, the S.S. Florence Martus, slipped smoothly away after a champagne christening. She was the 13th of 88 liberty ships built during World War II in one of the largest ship-building programs in U.S. history. Martus, who had greeted so many vessels, died a few months later. Florence Martus died on February 8, 1943, of bronchial pneumonia. Along with her family she rests in historic Laurel Grove Cemetery. On the banks of the Savannah River, at the east end of River Street, a 17-foot statue was erected in Martus' memory. The statue of a young woman, with a collie at her side, waves a handkerchief and continues to welcome seamen from around th e world. Here is the good wife descending the stone stairs that lead from Bay Street to River Street. 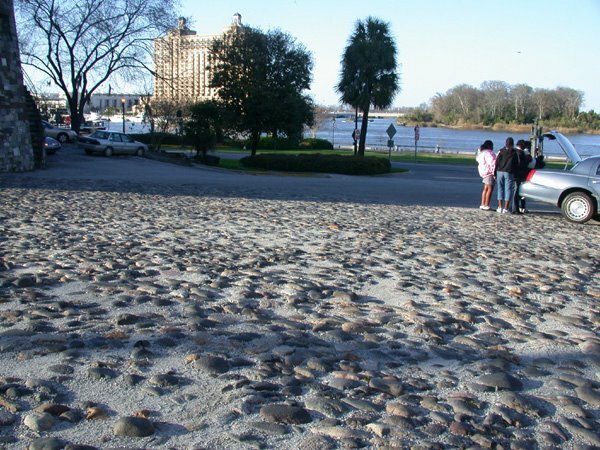 The stony ramps that connect Bay Street with River Street are made of English ballast stones, which gave schooners added stability for their trips from Europe, only to be thrown out and replaced with cotton bales in Georgia. 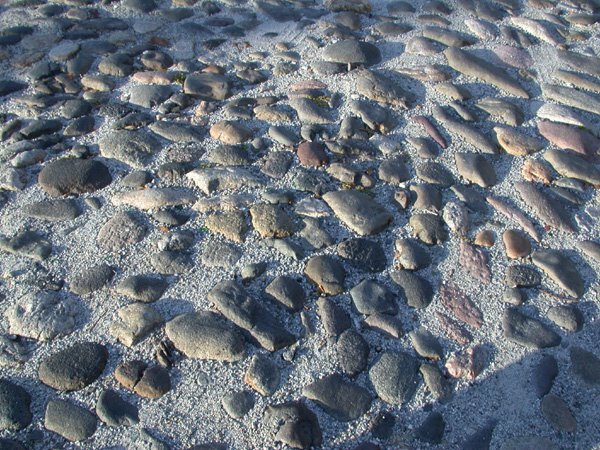 The stones were used in buildings and walkways, and became the foundation of ballast stone islands found today in river channels. 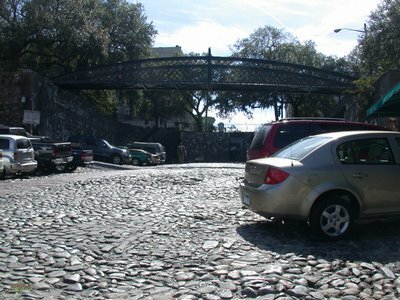 Savannah is a wonderful city. We arrived in the city on Sunday. First a little history is appropriate. General James Edward Oglethorpe and the 120 travelers of the good ship "Anne" landed on a bluff high along the Savannah River in February 1733, Oglethorpe named the Thirteenth and final American colony Georgia, after England's King George II and Savannah became its first city. 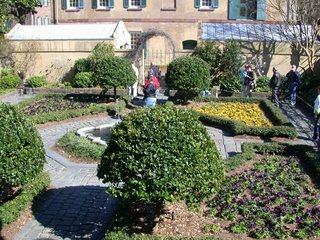 Oglethorpe laid the city out in a series of grids that allowed for wide open streets intertwined with shady public squares and parks. Today, the Historic District is a 2.5 mile walking district full of bistros, quaint shops, green squares and grand architecture. 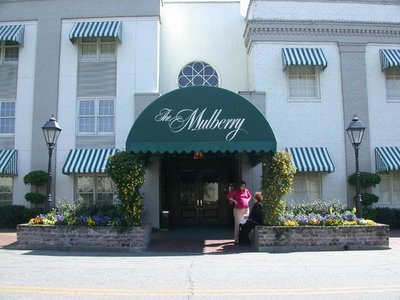 We stayed in the lovely Mulberry Inn on Bay Street just up the bank from River Street. 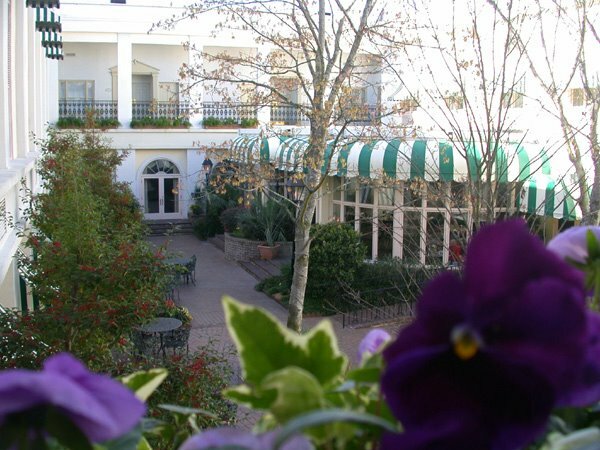 The Mulberry Inn takes you back to the elegance and graciousness of another era. 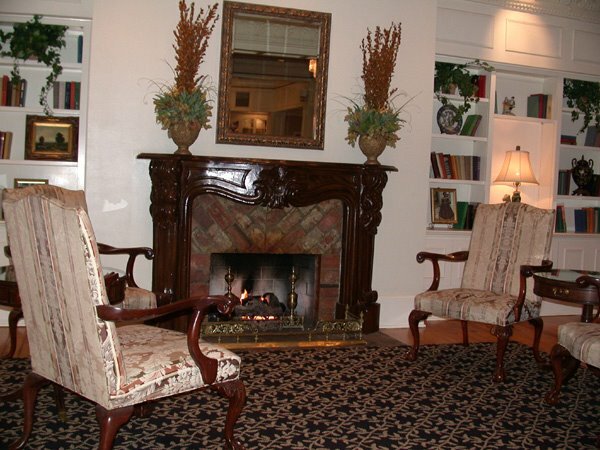 Throughout the hotel, you are sure to find that the period furnishings, oil paintings, polished hardwood floors, and elegant chandeliers offer an endless escape into Savannah's rich history. The Mulberry represents a style of service and hospitality that is traditional to the Old South. There is history behind this hotel as it used to be an old Coca-Cola bottling plant and a warehouse before that . 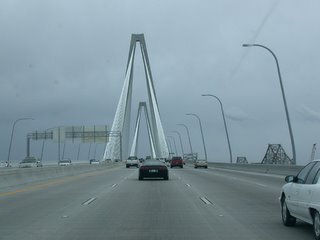 When we traveled on Route 17 from the Isle of Palms across the harbor to Charleston, we were amazed with the New Cooper River Bridge that opened last year. It is truly a work of art and an architectural wonder. 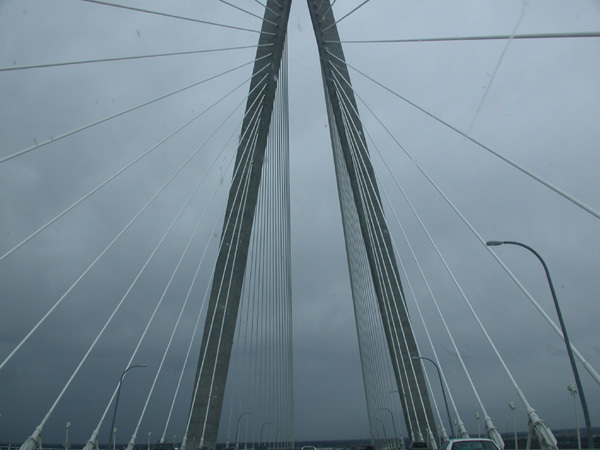 The new Cooper River Bridge has the longest cable stay span in North America, reaching 1546 feet over the Cooper River. 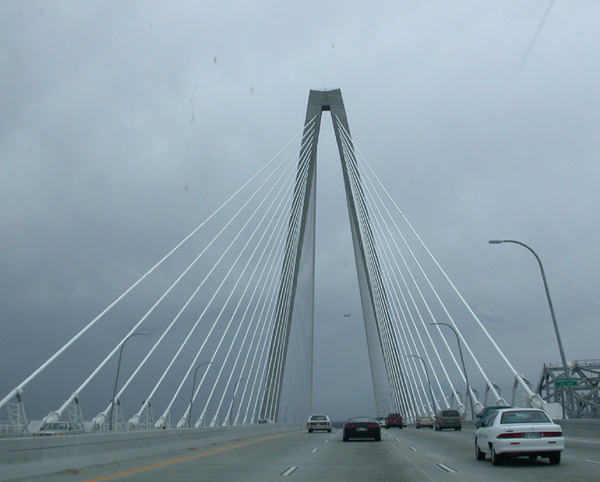 The bridge's 15-hundred-46-foot main span is supported by cables stretching down from the tops of a pair of diamond-shaped, 570-foot-tall towers. The roadway consists of eight 12-foot lanes, four in each direction. A campaign by locals eventually led to the addition of a 12-foot bicycle and pedestrian path to the design, which runs along the entire south edge of the bridge overlooking Charleston Harbor. 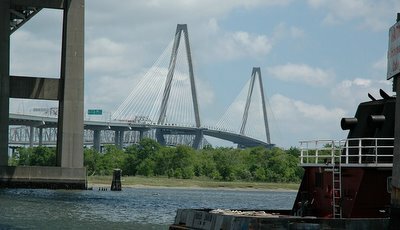 The bridge superstructure is constructed to withstand shipping accidents and the natural disasters that have plagued Charleston’s history. The span was designed to endure wind gusts in excess of 300mph, far stronger than those of the state’s worst hurricane, Hugo (1989). Engineers also had to be mindful of the 1886 earthquake that nearly leveled Charleston. The Ravenel Bridge can withstand an earthquake to approximately 7.4 on the Richter scale without total failure. To protect the bridge from uncontrolled ships, the towers are flanked by one-acre rock islands. Any ship will run aground before it can collide with the towers. 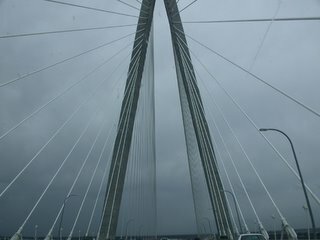 Here are a few photos taken through the windshield as we traveled across this beautiful structure. OK- Sarah is proud of her first young one - as she should be! 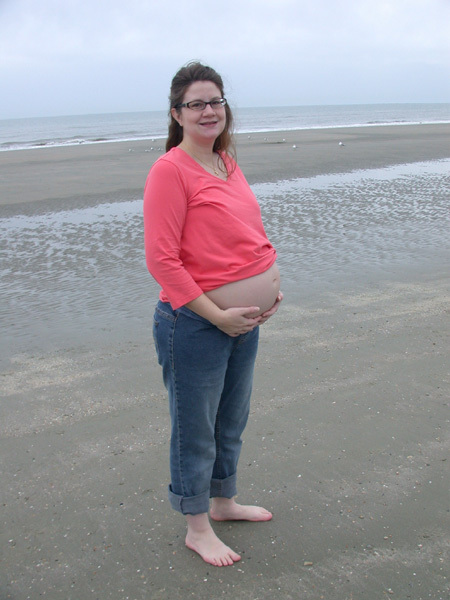 Here she is barefoot and pregnant on the Isle of Palms beach. (Photo was posted with the permission of the subject!) As you can see, our first grandson is being exposed to quite a variety of habitats. 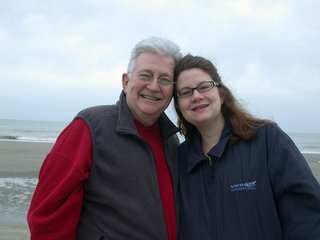 Last Friday we arrived at the Holiday Express on the Isle of Palms across the Cooper River from historic Charleston, South Carolina. 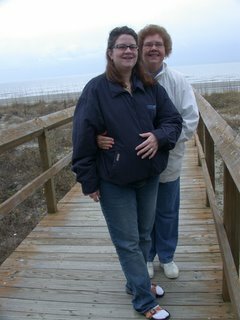 We spent a couple of days enjoying the sights of old Charleston and visiting our friends. Thanks Amanda, Jason, Chris, and Traci for your great hospitality. 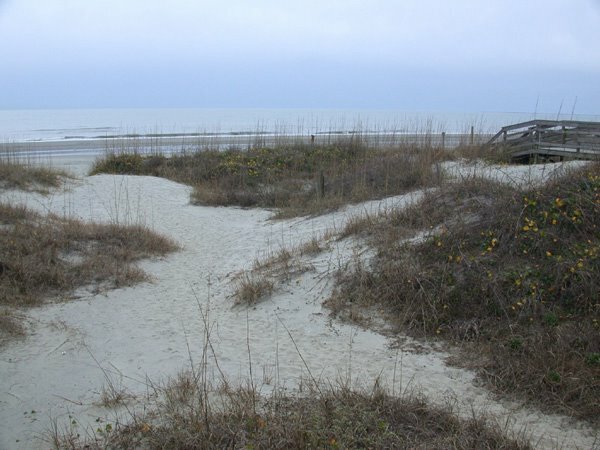 Originally named Hunting Island and then Long Island, the Isle of Palms is thought to be at least 25,000 years old, and first inhabited by the indigenous Seewee Indians. The Seewees were said to have greeted the first English settlers to the area by swimming to the ships and carrying the travelers to shore. Whatever contributions the English made to the Seewees reportedly inspired some of them to try and reach England in their canoes-all lost at sea in storms. 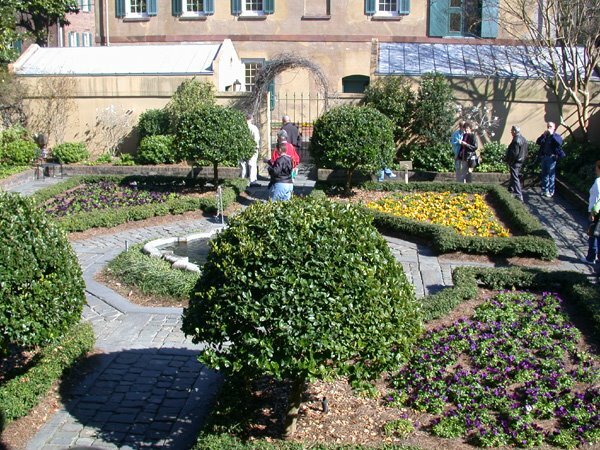 The island remained without permanent inhabitants until the late 19th century when the island became recognized by locals of the area as a refuge from the summer heat and tempo of Charleston. The island was purchased in 1899 by J.S. 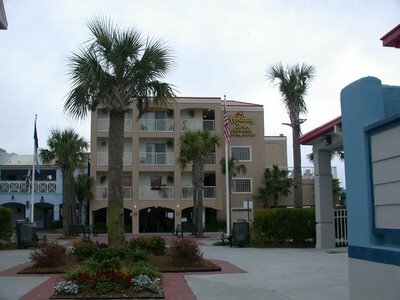 Lawrence, who renamed it the Isle of Palms. 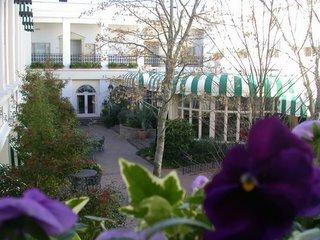 In 1906 a 50 room resort hotel was built to offer the first permanent accommodations. By 1912, James Sottile constructed a spacious beach pavilion and an amusement park with Ferris wheel. 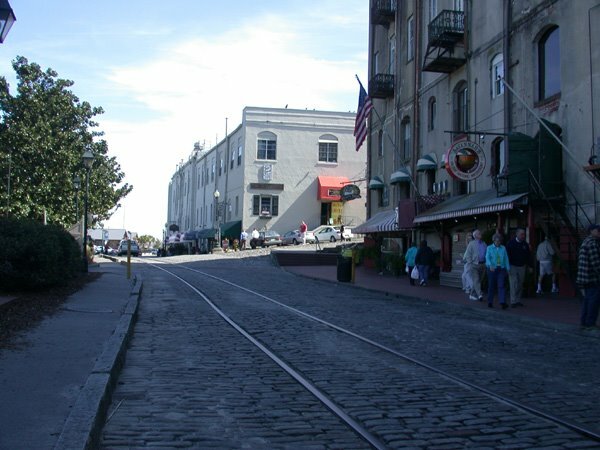 Accompanying transportation developments enabled residents of Charleston to catch a ferry to Mt. Pleasant, and from there catch a rail trolley car to Sullivan's Island and the Isle of Palms. Access became even easier in 1929 when the ferry across the Charleston harbor was replaced by the Grace Memorial Bridge. Here are a few photos of the West Virginia tourists enjoying the Altantic.